The Wokingham Society has placed a significant and historic oil painting on permanent loan to Wokingham Library. 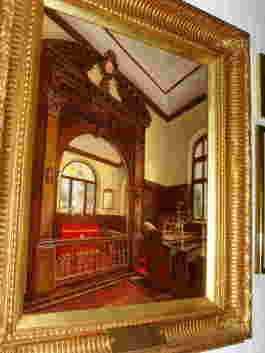 "The Chapel, Lucas Hospital" was purchased at Martin & Pole's auction rooms in December 2005 by the late Peter Baller, a trustee of the Society. It has been restored and framed professionally at the Society's expense by Helen Anderson, Fine Art Dealer & Restoration Artist of Wokingham. Henry Lucas Esquire, MP for Cambridge University in the 1640's, founded the Hospital in 1663 at Chapel Green, off Luckley Road. In 1675 the Drapers Company took over trusteeship of the charity; they ran and maintained the building continuously until a few years ago as an almshouse. When the Drapers Company closed the home in 2001 they put the building on the open market and it was subsequently sold to a private buyer. Planning consent was then given for this to become a family residence. Henry Lucas Hospital is Wokingham's only Grade I Listed Building. Recent research suggests that Sir Christopher Wren may have been the architect of the building. The oil painting is by Henry Frederick Lucas Lucas, an artist renowned for his equestrian subjects. His sister Louisa married in 1892 the Rev. Joseph Stratton, who was Master of the Hospital (1889-1917). Louisa was skilled at intricate wood carving and her work can be seen in the Chapel and the painting. When the Rev. Stratton died in January 1917 Louisa had to leave her home of 25 years. Her brother Henry completed the picture for her in 1919. His hunting scenes and portraits of horses are still very much in demand today. Contrary to the press reports obituary for Rev. Stratton, Louisa was not a descendant of Henry Lucas, a bachelor. However, she researched her family ancestry hoping to find a link with his; her volumes are deposited at the Society of Genealogists. She died in 1950 aged 96. There is a Wokingham Society Historic Blue Plaque at the main entrance to the Henry Lucas Hospital building. Further historic details can be found in the ' Blue Plaque Trail', leaflets available form the Information Office at the Town Hall.